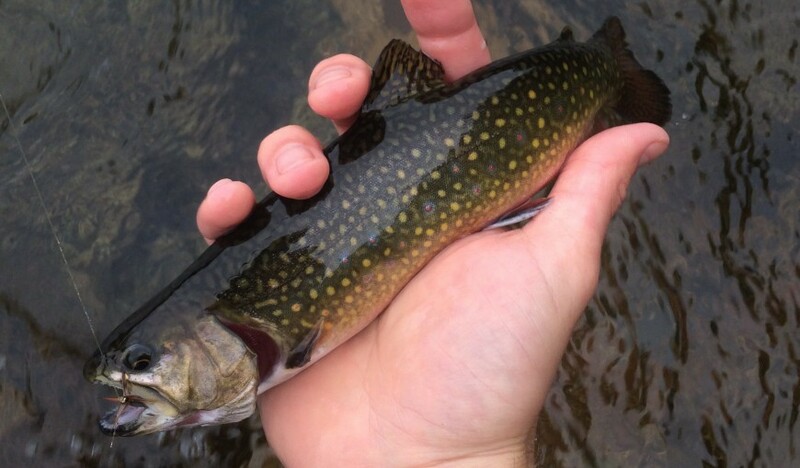 Brook Trout are native the New Hampshire, and thrive in various bodies of water. They are heavily stocked across NH’s lakes, ponds and rivers, but are often able to reproduce and sustain healthy populations. They often struggle in the warmer waters. I was taking a trip with my beautiful girlfriend through the mountains on a nice sunny weekend day. We had been exploring the mountains and rivers all morning with gorgeous driving and a short hike up in Crawford Notch. One of our favorite things to do together is to just wing it by driving randomly and pulling over at cool spots. It was at one of these spots where I found an amazing swimming hole…but by some miracle no one was there! So of course I went for a swim, did some rock sliding down the river, and then I grabbed my rod! Soaking wet from just swimming in the very whole I was about to fish, I stepped up on a rock ledge overlooking the hole, I tied on a big fat size 12 dry fly and tossed it over the hole. My 5th cast comes slowly drifting over the around 12 foot deep crystal clear pool, and I see from the very bottom a fish begin to rise. It was rising so slowly, and I watched as he rose all 12 feet and sipped on my dry. I set the hook and immediately realized how great of a fish this was. I actually had a GoPro on me, but forgot to turn it on until after I set the hook. I don’t think i’ll ever get to watch a better take than this fish. But at least I managed the footage above. You know what they say, “I hate to see you go, but I love to watch you leave”.